It appears that my July break during which I had planned so many activities has reached an unanticipated end. My Sydney trip was no sooner over that I was suddenly back at uni. How I would have liked to drag the July days and not sleep more than 4 hours per night in order to have more time for personal projects. Time time time! WHO'S GOT THE TIME???? 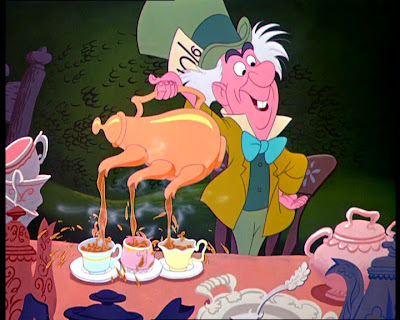 Disney's Mad Hatter - Try to beat that, Johnny! In case you are wondering about this magic quote, it is ejaculated by the Mad Hatter in Disney's Alice in Wonderland. I always enjoy that part. For me, it's one of the highlights of surrealistic cinema. Anyway, the next thing you know, Mad Hatter grabs the White rabbit's clock which he promptly diagnoses as being out of tune and attempts to revive it with a healthy dose of condiments, spreading butter, jam and everything else that appears on the non-anniversary party table, well, everything except, and it must be clearly enunciated in case one should ever make that mistake: mustard!! So just remember that. The report on the novel is that it's going splendidly. That is, I hate it. I've been reassured by a close writer/director/producer friend that this healthy hatred for a manuscript still in its early draft version is actually a very good sign. Well let's be fair, I do enjoy reading the individual chapters but remain concerned about the momentum (or lack of) between each section. I also feel as though some sentences are far too long to convey action and build up interest. It's not complete and stands now at about 155000 words. I have, however, completed most of the research. During the last bout of research, I found myself browsing through the Muslim architecture of Southern India during the 1400s. Meanwhile, the last chapter I completed related to the Tea Horse Trade at its peak, in particular, the trade route that linked the tea plantations of Pu'er (Yunnan, China) with Lhasa in Tibet, or Tubo as the Ming called it. As you can probably imagine, I've been around! My plan is to write a little each week while I complete the last semester of my let's-call-it-what-it-really-is, Psychology degree. So what else, have I been doing while my blog lay idle? Well the Tran Tien Genealogy is now complete and I'm also halfway through Aquarius. She is the fourth star chick from my Zodiac Girls series. This Mexican looking Gimp vamp shall be posted shortly. Please do not expect a woman carrying a pitcher. Aquarius is an AIR sign for heaven's sake. So no water thank you. May I squeeze in an irrelevant-revelation? I'm loving my current university subjects. One of them relates to the design of Psychometric Assessments. I'm learning how to design questionnaires to ensure that they are empirically valid in measuring the construct (e.g. introversion, risk-taking) that they purport to measure and that they are also reliable, that is, yielding consistent results for each participants over time. It follows that one of my great friends this semester is a Statistics application called SPSS. It's a lot of fun! It must be said, SPSS is almost as fun as Matlab. I remember feeling a surge of excitement whenever I plugged in a formula on the Matlab command line while analysing the trajectory of a ballistic missile for one of my engineering assignments. Back then I really believed that I'd join Nasa and dabble in secret weapons. Little did I know that I actually had a conscience. 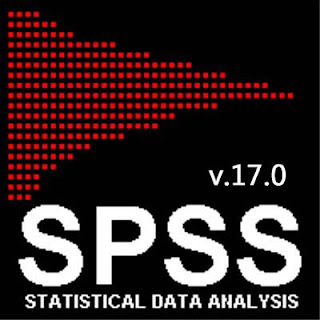 Anyway, that's my current SPSS passion. Many psychology students hate it, as much as they hate the Psychological Methodology aspect of the degree. Hang on, have you figured it out? Psychology is not at all about intuition is it? You have to use... wait for it...take a deep breath: maths! In fact, psychological findings are often very counter-intuitive so that without mathematical analysis it would not be possible to demonstrate that what we believe is "common sense" is actually wrong. Tell that to the next person who assures you that "human behavior is common sense and you don't need a scientist to figure it out." Well, it's just this. Let's pretend my name is Mrs Smith. I got a phone call from a Debbie from the Heart Foundation. I picked up the phone and said hello. Debbie: Mrs Smith??? Is that you?? etc... until I apologetically told her that I didn't have enough time to go fundraising in September and hung up. Let's just say that I had a similar encounter almost 18 months ago when a police officer called to discuss the Police Youth Club. He was much more to the point. He asked to speak with my mother. Yes, I know, I've already ranted about how young I look for a 33 year old. But this is much worse: I sound young too. Joy! I'm not going to feign exasperation for having good genes but this voice thing better not work against me at job interviews! Imagine, it's like walking around with a "Don't Take Me Seriously" sign on my forehead. Debbie was sooooooo relaxed talking to me, I bet she'd have put on her best professional voice and donned on white gloves had she been speaking to a deep-throated gentleman on the phone. Why are people so fake? If you change your speech mannerisms while talking to different people based on their age (social background? ), one day you are bound to find embarrassment because of incorrect assumptions. Personally, I much prefer to be humble and respectful as often as I can rather than adopt a power stance based on who I talk to. You never know who that stranger is. And actually, regardless of who that stranger is, it ought not to determine how respectfully you treat them.